Witch is When it All Began by Adele Abbott – quick review – Read it or Leave it? Red by Jessi McPherson – a novella Review! Red – Silver Dagger Book Tour and Giveaway! Avengers: Infinity Wars – Watch it or Skip it? Movie Review – Truth or Dare – Watch It or Skip It? Movie Review: You Were Never Really Here – Watch it or Skip it? Amazing Race 16 – its Here! Make It or Break It Season 2 Episode 7 – What are you made of? L. M. Schukraft – about the author – Has MOVED! The Crooked Halo Series has moved! REVIEWS: Find Out What Others Are Saying About Even Halos Can Be Crooked! New 5 star Review – Why haven’t you read Even Halos Can Be Crooked yet? Book Tour Links for July 4, 2017 to August 4, 2017!! It’s started! Book Blog Tour – Coming to you July 4th to August 4th! Halfling – Silver Dagger Book Blog Tour Giveaway!! $.99 ebook Promo!! Get Your Copy of Even Halos Can Be Crooked Today!! Locked Out ARC review sign up!! 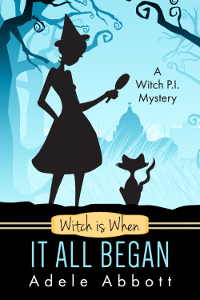 Rebuild Cozy Mystery Series – COVER REVEAL! Castles in the Sky is here!! Where to buy! Castles in the Sky – Cover reveal! In the spirit of paying it forward as an author, I’m going to try and get back into writing reviews. Instead of doing long reviews, though, I’m going to do quick posts that highlight the positives and whether or not I’d recommend to read it or leave it. On a whim, I clicked on a Facebook ad for a series written by Adele Abbott. I knew nothing about the author but her cover intrigued me as well as the story premise. The series focuses on Jill Gooder, a private investigator with a one-eyed cat, who discovers she is adopted. A little while after finding out that she is adopted, she learns her birth mother is dying and Jill goes to visit her. Her birth mother shocks Jill by calling Jill a witch, right before dies. Strange things start to happen to Jill after that. She takes on a case to find a serial killer in the first novel and the story takes off from there. I read this book months ago and found the fast pace writing to be interesting. I like books that move quickly and don’t dawdle. I also enjoyed that the author used English colloquialisms (as in England’s English) because I wasn’t used to the phrases. It added a little something to the story. I liked the author’s play on names and how very few characters in the book would catch the irony in the names. Not getting into a plot description or going over what happens – I liked the book. I would definitely recommend to read it. I liked it so much I went out and got the whole series and am now following it. As a paranormal genre, you will see characters popping up that are classic fairy tale critters in the series. Abbott gives them a familiar feel with a little bit of a new twist. She has a variety of characters in her books – each with their own unique set of quirks. The main character, Jill, is addicted to custard cremes and cupcakes. Her secretary has a knitting obsession. Her cat has one eye. He plays an important role as Jill’s office mate. The dynamics of the characters are interesting and all play well off of each other. The mystery is about right in the middle level of difficulty – not too easy to solve but not too hard either. Not only that, Jill Gooder usually finds herself following multiple cases and helping people out. Positive elements: humor, mystery, paranormal, fast pace, quick read, new books come out just about every two months. Each case is usually solved by the book’s end with little tiny cliff hangers to draw you into the next book. You can follow the author on her website and pick up a book here. The 23rd book in the series, Witch is Why Promises Were Broken, is due to be released December 1, 2017.